This game was developed by adapting the Tower Defense tutorial from Ray Wenderlich's site. Monster and Ladybug sprites as well as sounds and background music are from the tutorial, and not my own. 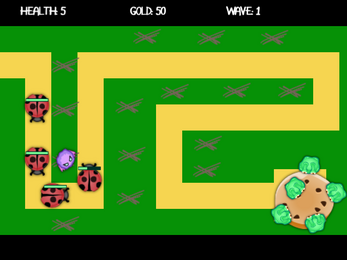 Place monsters to defend the cookie from hungry ladybugs! Each wave the ladybug's get stronger, but the gold rewards become greater! Last as long as you can!